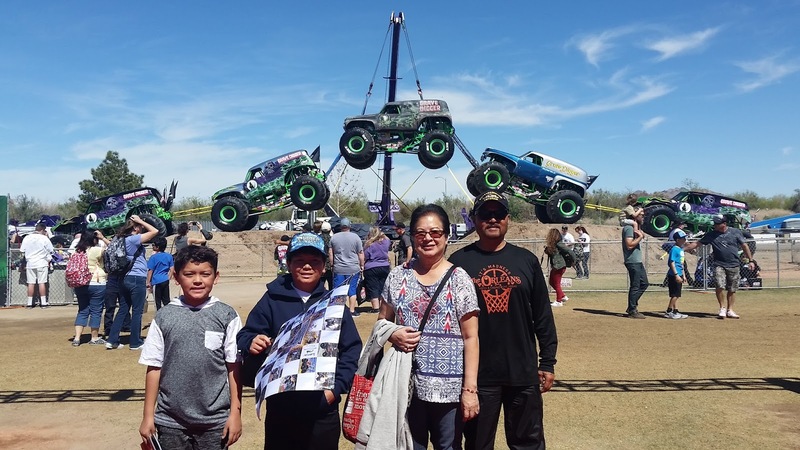 It was another successful Monster Jam World Finals XVIII weekend!!! 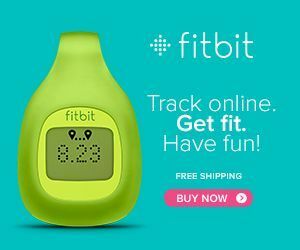 My family and I attended both Friday's racing finals and Saturday's freestyle finals. We went and enjoyed the Pit Party on both days. The goal for my boys every year is to meet and get autographs of the drivers they had missed the previous year and to meet any new drivers. Friday we did just that. I also brought my parents along this year. 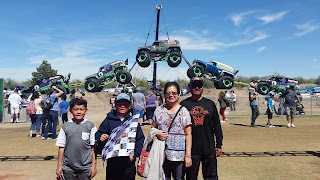 This was their first Monster Jam World Finals experience. By the end of the night...they were hooked! They are ready for next year's event! After all the years of going to Monster Jam shows and Pit Party's we finally got in (after waiting in a 1hr and 40 minute line) to see Grave Digger's Adam Anderson, Morgan Kane, Cole Venard and Tyler Menninga. They were the nicest guys, sweet and friendly to everyone they met. We were big fans of Mohawk Warrior and were excited to meet the new driver; Bryce Kenny. We stopped at every other truck along the way and got signatures and pictures with the drivers. The racing finals were fun. Son Uva Digger won the racing finals and the night ended with a big finale of all the Monster Trucks coming out on the race track. Check out the video I took here. It was the great ending to the night. All we could think about is how fun the freestyle show was going to be. The Freestyle finals the next day was the big excitement. It's when the drivers can go wild out. The fans love it! They get loud, excited and root on their favorite truck and driver. We were rooting for Monster Energy and Todd LeDuc/Coty Saucier and Son Uva Digger and Ryan Anderson. We invited my son's friend along with us. It was his first Monster Jam experience as well. He has watched it every year on TV, but has never attended a show. What better way to show him the World Finals by taking him to the freestyle show! He loved it. My boys played photographer during the show and took so many photos! They loved capturing each jump, each crash, each flip and everything in between. I wish I could post them all here for you. 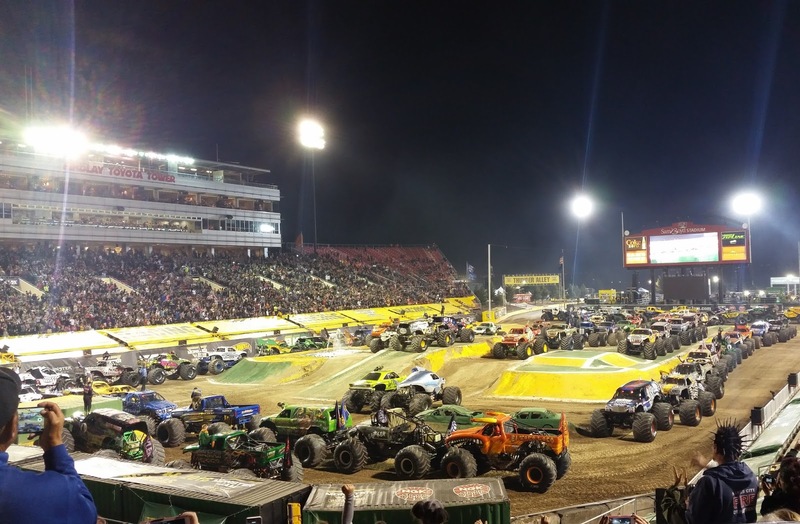 One thing I love about the World Finals at Sam Boyd Stadium is the layout of the Pit Party. There never seems to be a problem with the space and the areas the trucks are in. The traffic situation before and after are well maintained too! So if you have not yet experienced a Monster Jam show in your city definitely try it out! And if you're looking for more..the World Finals in Las Vegas will not let you down!! !